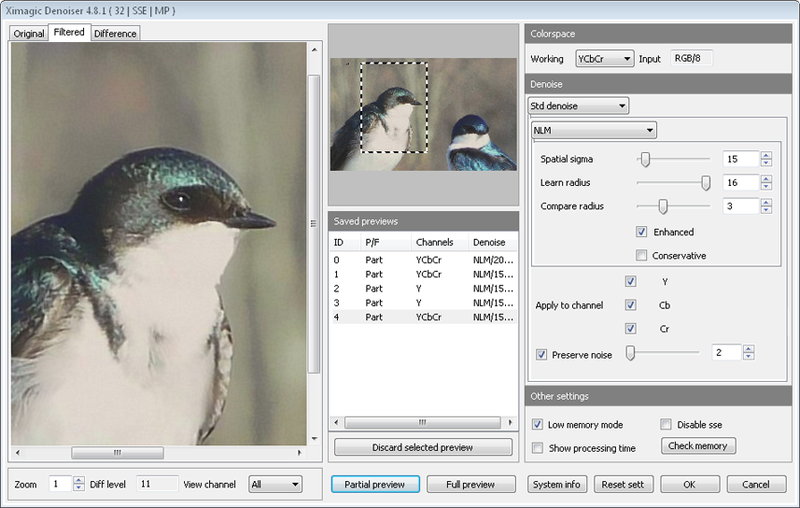 Ximagic Denoiser is Photoshop plugin for Windows x64 for image noise reduction. Generally speaking, the first methods used was median and Gaussian blur, the first one is good for salt and pepper noise and the second is of more general use. Those first methods blur the image and the edges of it. Those methods can be called local blurring because it only take into account a small number of pixels near to the processed one. Blurring the edges of a image is not usually accepted, and then come the bilateral filter which take into account the distance from each point to the processed one in color and position. This is probably the method more usual today. Another kind of methods was based on decomposing the image and filtering it, FFT wavelets and DCT. From those methods, wavelets are actually more used. It gives a good relation between smoothing and preservation of edges. A recent method which not only reduces noise but also defects and scratches. For medium/low noise images this is the best method. This family of methods are based on the diffusion equation. Those methods are used mainly in the area on medical image processing. The included one is Anisotropic diffusion. Usually if the image have medium/low noise, non local means give the best results. For high noise images usually a combination of wavelets and non-local means give the best results.